It's here! And by “it”, I mean my Spring Stitch Fix box, and also the arrival of spring weather. 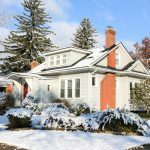 After a very reluctant start, spring temperatures have finally begun to make an appearance in Michigan and I am hopeful that winter weather is finally behind us. Even with the delayed spring weather, my fix this month was pretty fabulous. It was also filled with great layering pieces – because my stylist somehow must have known that I would need warmer items to get me through the changing temperatures right now. It may be getting quite warm during the day, but the nights and early mornings are still downright cold. Speaking of my stylist, I got a new one this month. I'm not exactly sure what happened to Kate (my previous stylist), but I noticed that Julie styled me this time around and she mentioned giving me “a season full of perfect fixes” so I have the feeling that she will be here to stay. 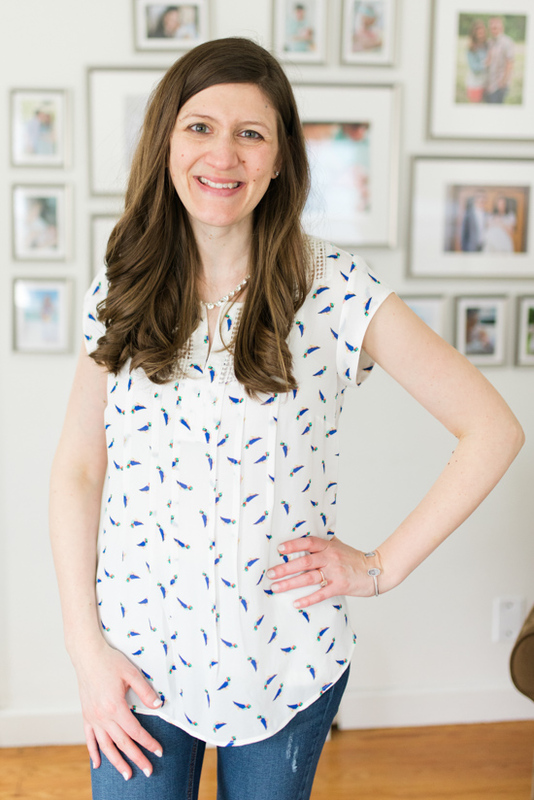 Kate started styling me for maternity fixes when I was pregnant with Dessa so I have suspect that maternity and post-baby is her specialty and now that I'm 100% back to normal (or at least as normal as I will ever be again) I may have transitioned back to a non-maternity stylist. All of this is speculation, of course. Regardless, I can't wait to show you my spring fix. Julie did a lovely job and I'm already excited to see what she ends my way next month. 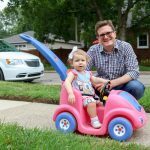 One quick note before I continue: this post contains affiliate links. 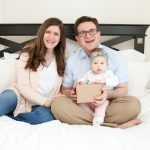 I earn a small commission each time someone makes a purchase or signs up for Stitch Fix through one of our links, which helps to support the blog and our family. 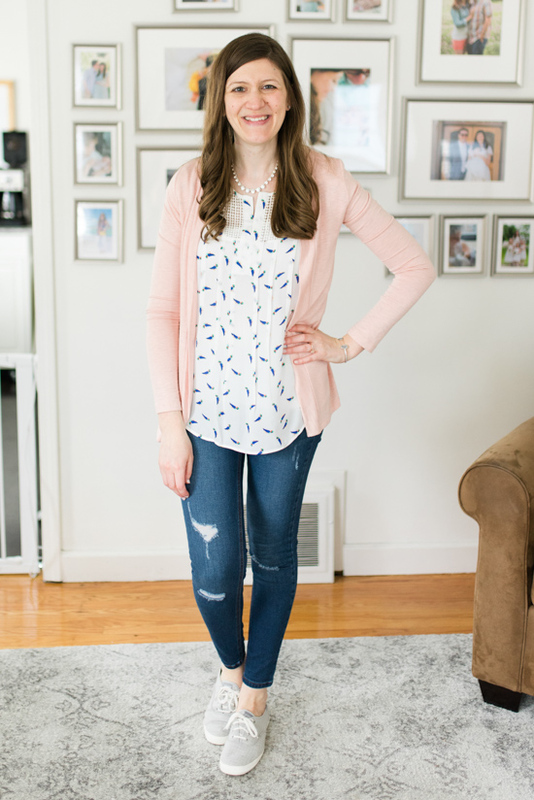 I hope you enjoy today's Stitch Fix review as much as I enjoy sharing it with you! By now, you might be wondering, “what exactly is Stitch Fix and why do I keep hearing about it?” Simply put: Stitch Fix is an online personal styling service that matches you with a personal stylist who hand picks-five items just for you and ships them directly to your door. Keep what you love, send back what you don't, and enjoy free shipping both ways! A $20 styling fee is applied when you order your fix, but the styling fee is automatically deducted from the price of anything you choose to keep from the fix. I always make a point of purchasing at least one thing from my fix so that I don't lose the cash from my styling fee. And you can really score big and save 25% if you choose to keep everything from your fix, thanks to the Stitch Fix buy-all discount! Stitch Fix offers plus, petite, and maternity styling, as well as styling services for men. As for why you keep hearing about Stitch Fix: because it's simply amazing. This service has absolutely changed the way I shop and transformed me into a more fashionable person along the way! 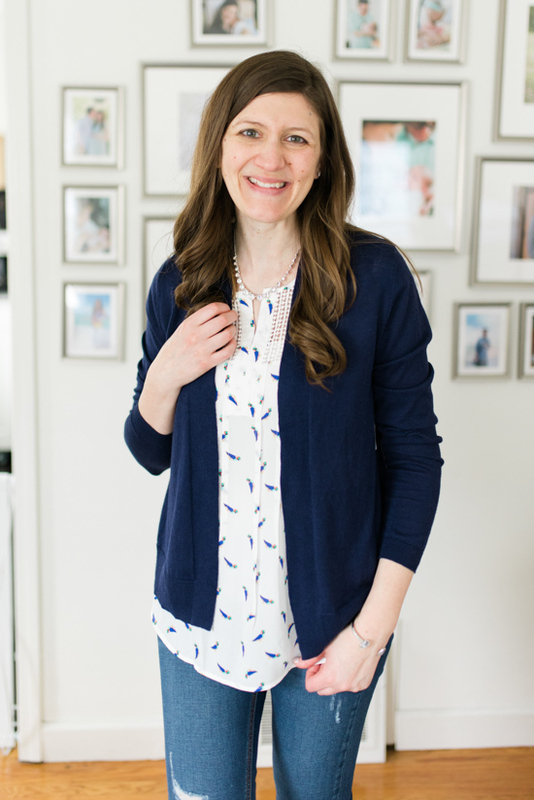 If you've been wondering about Stitch Fix for a while, you can create your FREE Stitch Fix style profile today and schedule your first fix whenever you are ready. 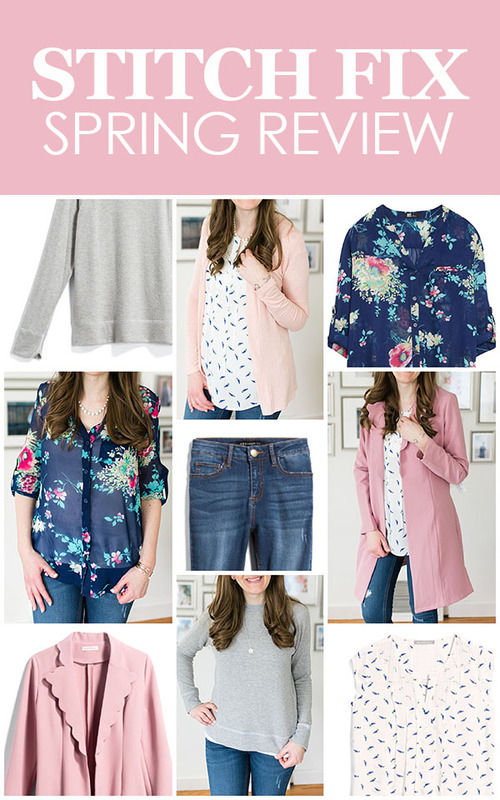 Now are you ready to see my Spring Stitch Fix review? 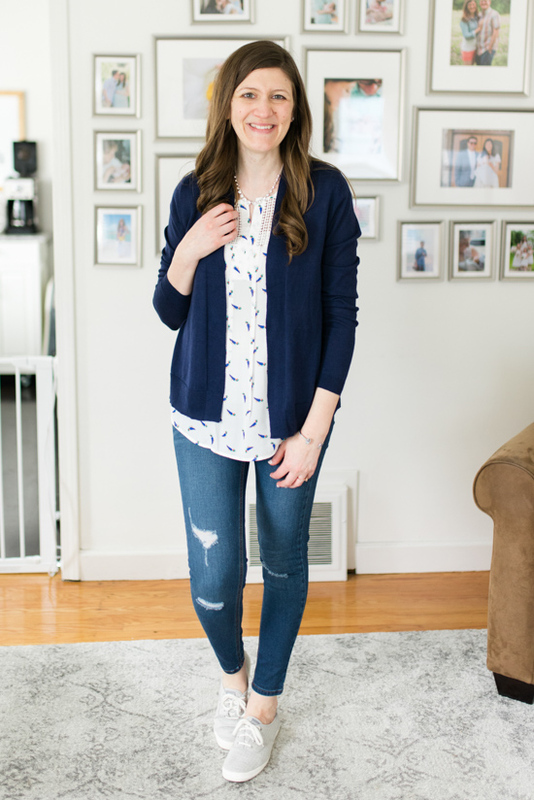 You'll definitely want to read all the way to the end of the post because I'm teaming up with some of my blogging friends to bring you a $300 Stitch Fix gift card giveaway this month. Yay! 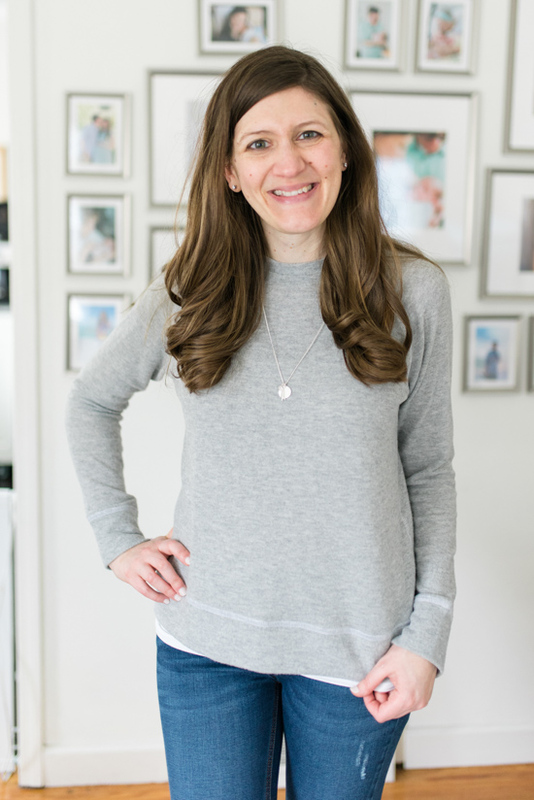 When I first glanced through the Stitch Fix app to see which items were coming my way, I was certain that I would end up keeping the Jillyan Raglan Sweatshirt from LNA ($98). It was such a great, basic piece to add to my wardrobe. Then I touched the sweatshirt and felt how incredibly soft it was. THEN, I noticed the price. With a $98 price tag, I knew I probably wasn't going to keep the Jillyan Raglan Sweatshirt, but I tried it on anyway. 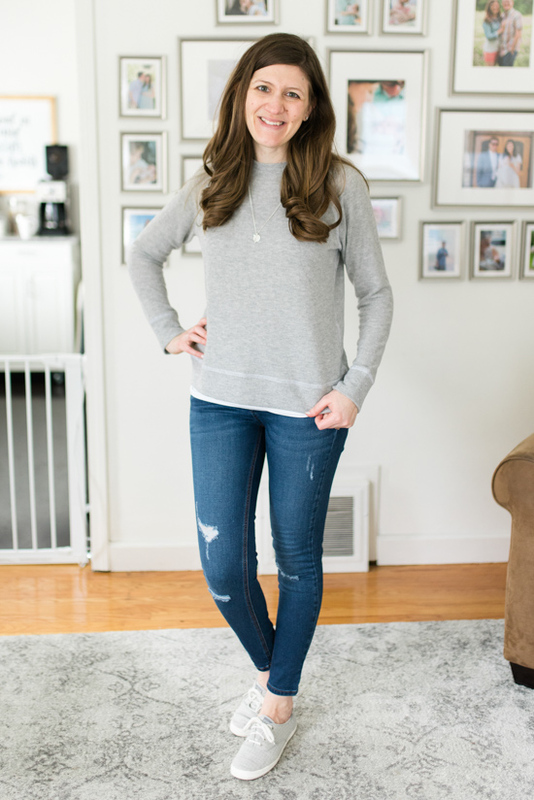 I styled the Jillyan Raglan Sweatshirt with my gray Keds, a pair of distressed jeans that also came in my fix (more on those in a minute), and a simple lightweight pendant necklace. I also wore a white tank top from Old Navy underneath the sweatshirt. The sweatshirt was super-soft and very comfortable but it was just a touch shorter than I wanted it to be, which made it even easier for me to rule the Jillyan Raglan Sweatshirt out as a keeper. I loved trying it on, I just knew it wasn't meant for me. You might recall that I just purchased two new pair of jeans from Trunk Club a few weeks back, so I didn't exactly consider myself “in the market” for a new pair of jeans. 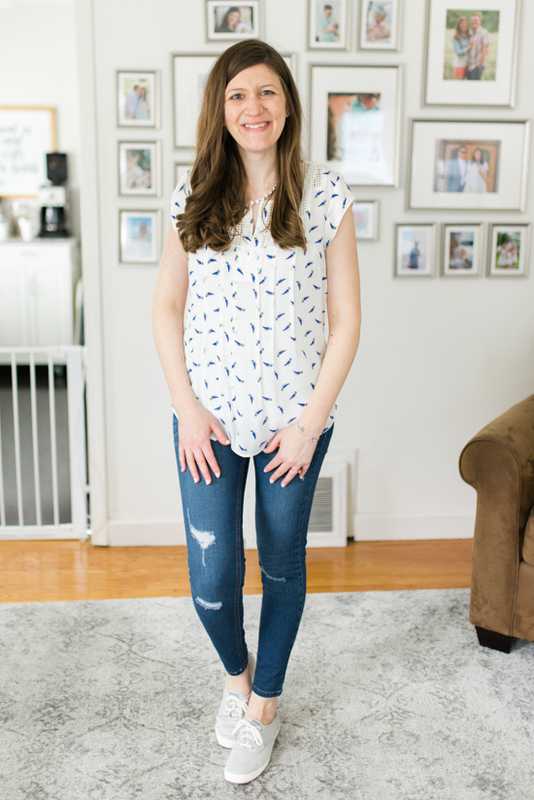 Both of those jeans were free of holes and I can always appreciate a conservatively distressed pair of jeans (I think I just made that expression up, but you know what I mean) so the Avalie Distressed Skinny Jean from Prosperity ($78) caught my eye. The Avalie Distressed Skinny Jeans were also a perfect fit. The denim fabric wasn't particularly soft, but they had great stretch and fit like they were made for me. Not only that, but that had the perfect amount of distressing – just enough to make the jeans casual and interesting, but not so much that they looked like they were falling apart. I was so, so, so tempted to keep them! But I had three more items to try on, which all had lots of great potential, which made it too early to decide quite yet. I kept on the Avalie Distressed Skinny Jeans and changed into the Estefany Lace Detail Split Neck Blouse from Daniel Rainn ($64). I was already a little smitten with the blouse before I tried it on because it was a soft neutral color and I loved the pleat details down the front of it. The bird print added a sweet and charming element. I especially loved that this blouse could easily be dressed up or down. In this case, I decided to dress the blouse down with the distressed jeans and my gray Keds. 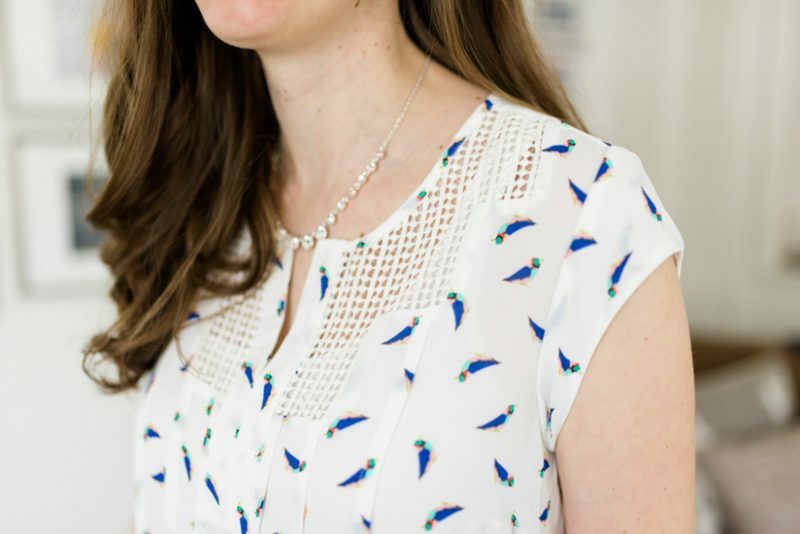 I added a feminine touch with my silver and gray Kendra Scot Elton bracelet and a super-simple statement necklace that I bought in-store at Old Navy (you can grab a more elaborate version here). What I love most about the Estefany Lace Detail Split Neck Blouse is how versatile it is. 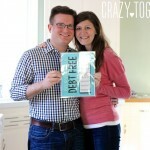 The blouse looked beautiful on it's own with just a pair of distressed jeans. For an added layer, it also looked great with a navy or a blush pink cardigan. I don't know about you, but I'm partial to the pink! As excited as I was about the Estefany Lace Detail Split Neck Blouse, I got all the heart eyes when I saw the Marissa Scallop Trench Jacket from Honey Punch ($68) that Julia had included in my shipment this month. 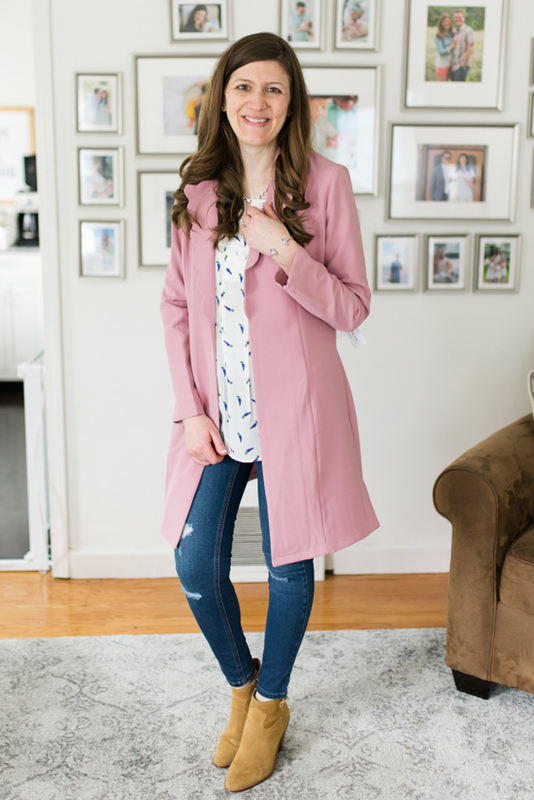 I always have a weakness for great outerwear and I just recently bought an amazing pink spring jacket. 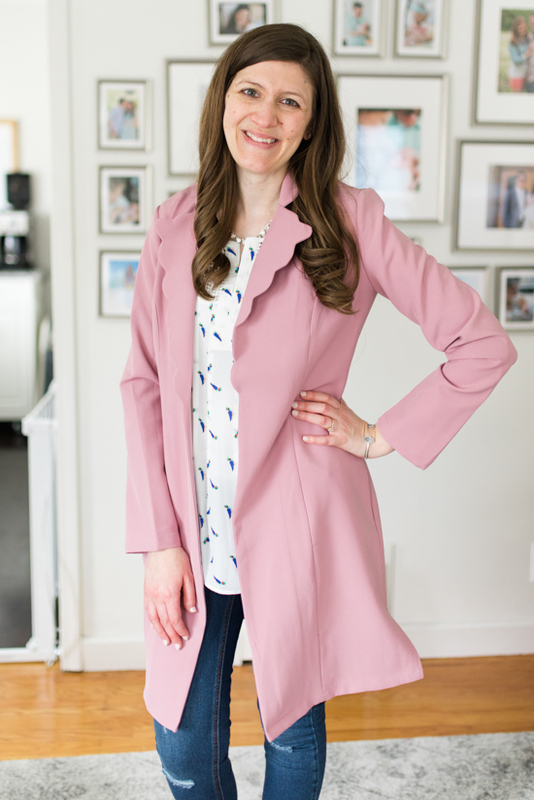 I really didn't need another pink jacket, but this one was a trench with scallops! Scallops! I kicked off the Keds, put on a pair of camel brown booties and added the trench over my ensemble. As it turns out, the Marissa Scallop Trench Jacket wasn't as fabulous on me as it was in my head. It was a little boxy and it felt a little cheaply made. The jacket wasn't lined and the polyester had a funny texture. 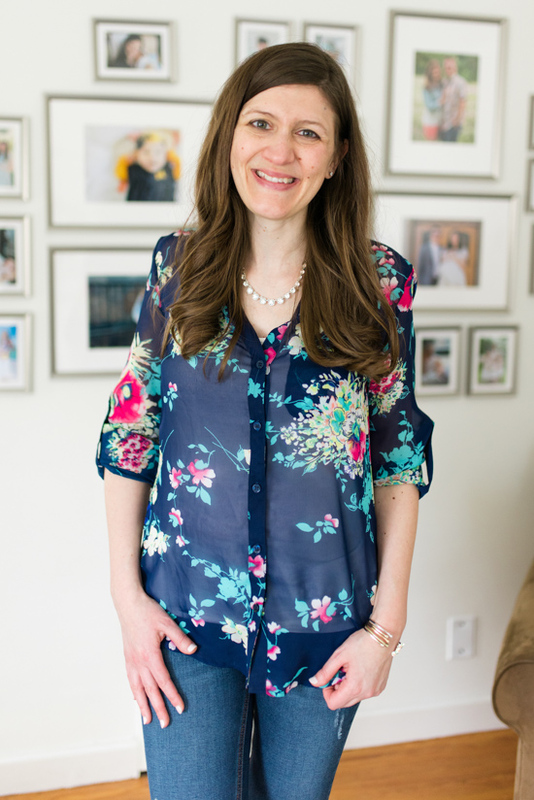 Don't get me wrong, I have plenty of polyester items in my closet – mostly blouses from Daniel Rainn (including the Estefany Lace Detail Split Neck Blouse) but they all feel soft and silky. The Marissa Scallop Trench Jacket was different and I really didn't care for the way it felt. Needless to say, this one wasn't a keeper, but it's a good thing since I have a perfectly good new pink jacket already sitting in my closet. The Sinclaire Floral Print Blouse was fabulous. It was a perfect fit and a great floral blouse. It was soft, feminine, flattering, and would be a great addition to my closet. At the end of the day, though, I loved the white Daniel Rainn blouse the most, so this one had to be returned. What a shame, though, because it was so cute! 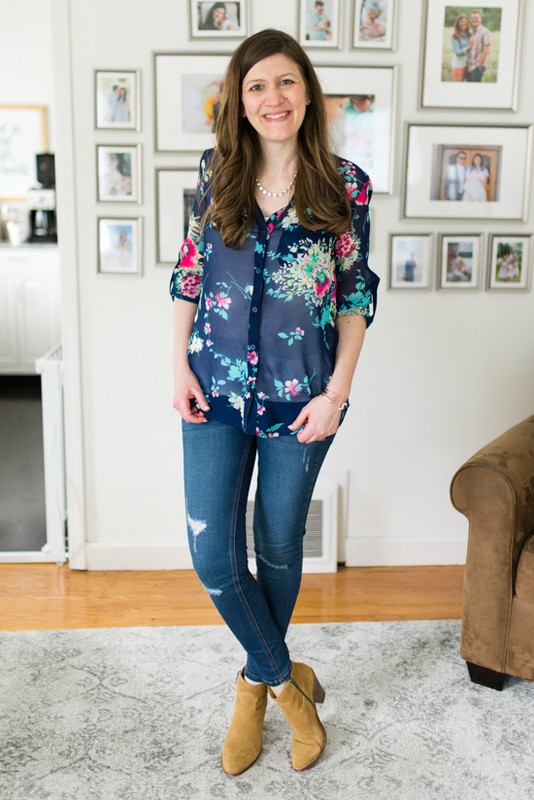 My Spring Stitch Fix shipment definitely required a healthy amount of self-control because there were so many great items inside – especially the two fabulous blouses and distressed jeans. I went in circles over which item to keep but ultimately decided to keep the sleeveless white blouse. It was too sweet to send back and I couldn't resist the fun twist on a classic white blouse. 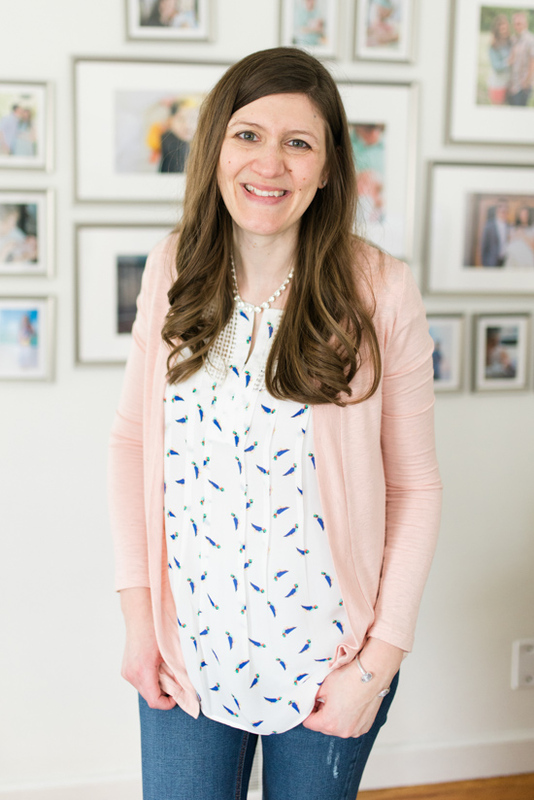 What Stitch Fix review would be complete without a giveaway? 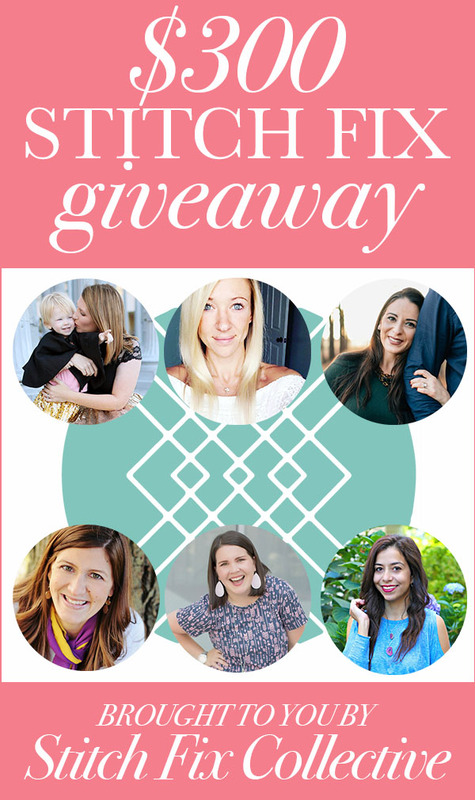 I'm thrilled to partner with my favorite Stitch Fix bloggers again this month to bring you a $300 Stitch Fix gift card and I would be ecstatic if a Crazy Together reader was the lucky winner! Use the Rafflecopter below to enter. Good luck! I am wondering how many pieces you normally keep from a fix. I always feel “pressured” to try to save my $20 “fee” and the “discount” … but I am difficult to fit. Some things would need major alterations … just not worth it. I’m trying Stich Fix again after a long absence. The new stylist has really listened to my “fitting” issues as well as my style sense. Although she is doing a fabulous job, I don’t believe that Stitch Fix has enough of a supply of petite clothing to cover their demand. I would have tried an smaller size and kept additional pieces had there been availability. I’m not certain that I can justify keeping just 1or 2 pieces from a Fix and pay full price + fee. What are your thoughts? I note that you only kept 1 blouse from your above Fix. Hi Connie! My clothing budget has changed substantially over the past few years. There was a time when I kept everything I loved (whether it was one item or all five). These days, I have a limited clothing budget so I almost always keep just one item. My goal is to try and earn my styling fee back. Love the Estefany Lace Detail Split Neck Blouse. I’m only a few miles away and I would have to say summer weather is here, not spring! I received my first fix last week and also got the Estefany Lace Detail Split Neck Blouse, which I absolutely love! It is so cute, comfortable, and versatile! I kept the Sinclaire Floral Print Blouse but sent back the Estefany Lace Detail Split Neck Blouse because I didn’t want to have to wear a tank underneath it. The open lace made the top feel really low / exposed. Glad you like it! I totally get it. I wear a tank under almost every shirt so I didn’t mind the extra later but I can understand feeling exposed without one! I also received the Estefany Lace Detail Split Neck blouse this month. It’s adorable and I fell in love with it straight out of the box. Our styles are a lot alike. Last month, I received the same red capris you did and definitely sent them back.